On Wednesday I was longing for snow and my wish almost came true. It was raining as I headed into town to see a film and so heavily that I have never seen so much water running down the streets of the city. On the way back to the flat it had turned to sleet and wet snow was lying on the grass. Higher altitudes had the real stuff and a little sprinkling was left on Blackford Hill. My neighbour said he had never seen so much water running down the mound. I woke on Friday morning to clear blue, a crescent moon and contrails stretching across the sky. 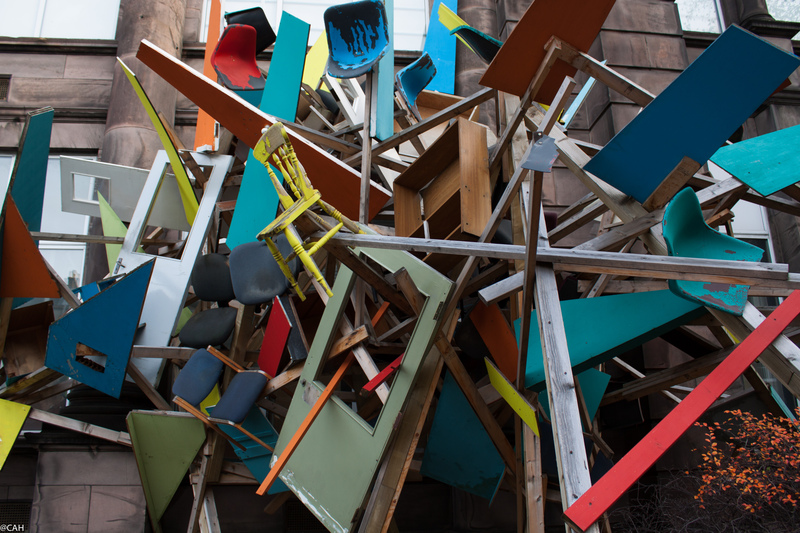 I had to get out and for a change, wandered east along Grange Loan for some supplies at Earthy, then down Causewayside noticing as few antique shops and upcycled furniture shops that will be worth a look in at some point. I passed the National Library of Scotland which is being renovated and will have to go in there at some point as this location houses the old map collection. 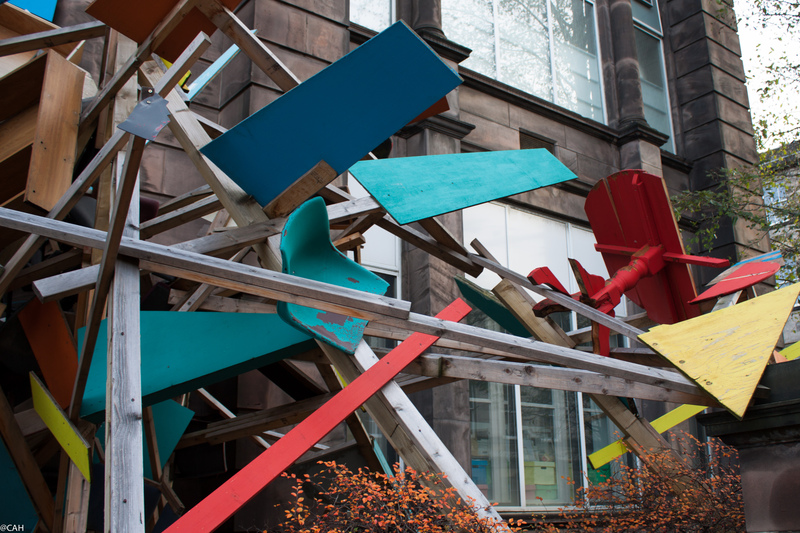 At Summerhall, the Mexican artist Antonio O’Connell’s permanent installation ‘Virus’ made from recycled materials has sat outside since last year (Summerhall is housed in the former veterinary medicine school). I picked up some newsletters but did not see a current exhibition that appealed so headed for Till’s bookshop. 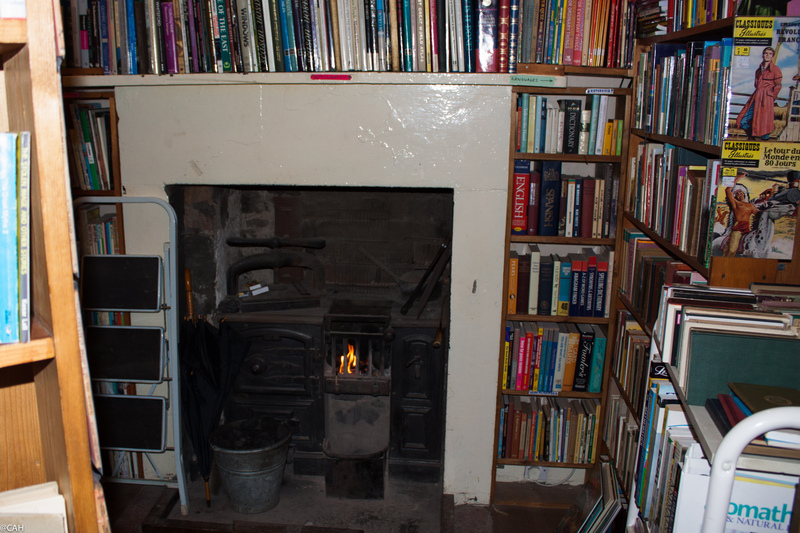 The proprietor is a Canadian who has lived in Edinburgh for 30 years. I have lived in or visited Edinburgh regularly for more than 30 years and often pass the shop on the bus up from the city centre but today was the first day that I went in. The original range with a real fire reminded me of Reid’s in Liverpool. Saturday’s storm was named Desmond and large parts of Scotland and northern England are flooded. We braved the high wind and rain to head into town for a book fair. I saw one elderly man’s cap blow off and bowl down the street. Fortunately, he managed to rescue it. 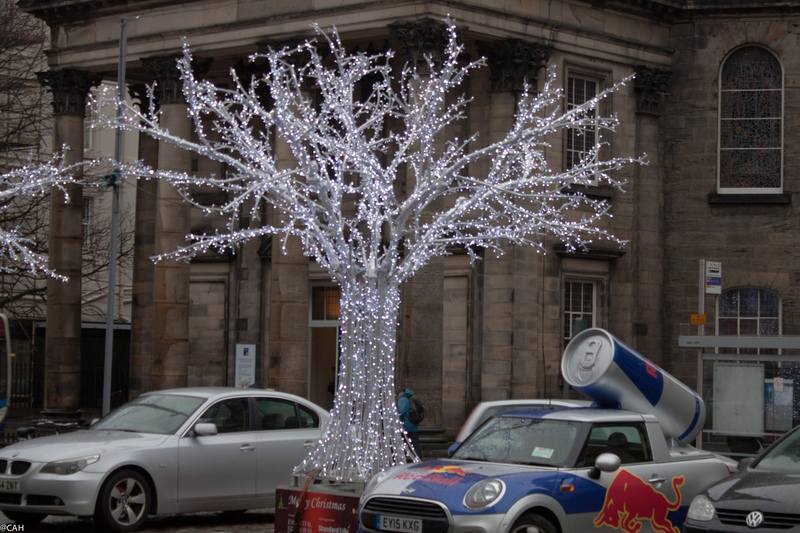 One of the Christmas decorations still standing was this fairy light tree in George Street. Parked next to it was a Red Bull car. Something I would need if I had to party all night. Instead we had a relaxed meal with friends. Today was another sunny morning so we set off reasonably early to drive back down south in daylight. No meandering in the Borders today. There was a lot of water on the A702 but the snow had gone from the Pentlands. 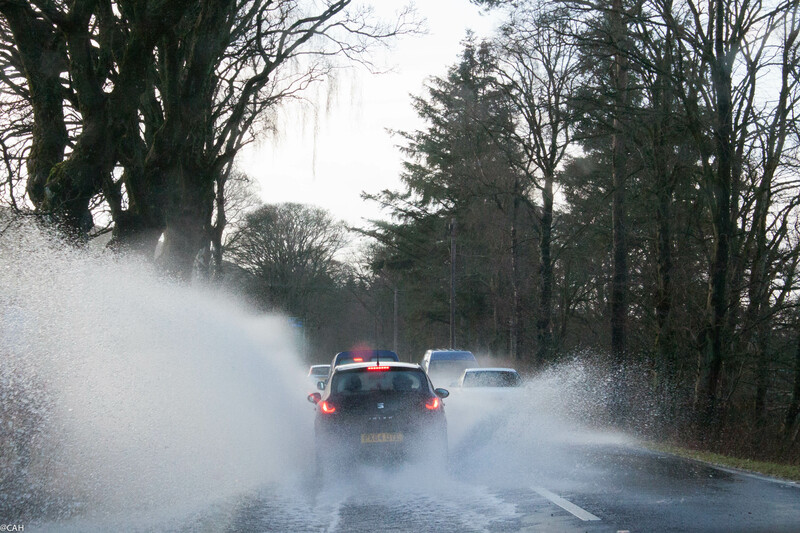 Otherwise, it was an uneventful drive back but we could see large areas of flooding all around in southern Scotland and Cumbria and the water was almost up to the edge of the motorway in places. The radio told us of people being rescued, power cuts, landslides and flood defences being breached.